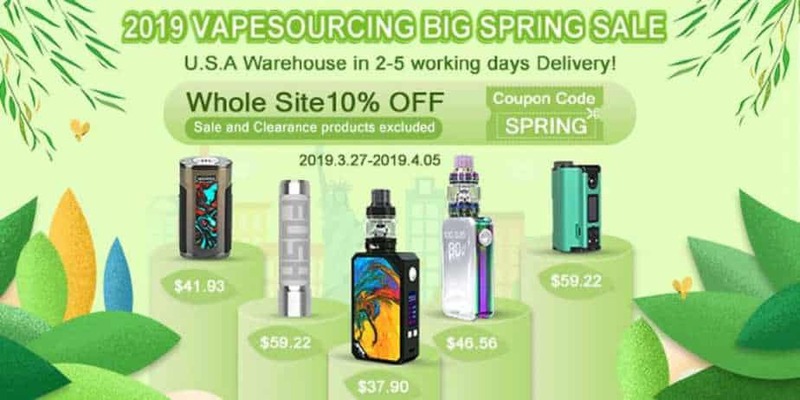 Home → Vape Deals → VapeSourcing Big Spring Sale! Up To 65% OFF! VapeSourcing Big Spring Sale! Up To 65% OFF! For a limited time only, VapeSourcing is having their Big Spring Sale right here where you can save up to 65% off various products! You can also use coupon code "Spring" to save 10% off the entire site! During the VapeSourcing Big Spring Sale, you can save up to 65% off select products! In addition, you can also save 10% off sitewide using the coupon code provided. They are running 5 different flash sales as well, saving you even more cash! This sale includes all a variety of vape gear from popular brands such as VooPoo, Smok, Vandy Vape, Wismec and more. Some of the current deals are the Vandy Vape Pulse X Squonk Kit for $62.00, the Smok Priv v8 Starter Kit for $25.73, the Geekvape Aegis Mini Kit for $51.65, the VooPoo Drag Resin 157w Mod for $46.95, the Wismec Reuleaux RX2 Mod for $22.89 and tons more will be listed below. All in all, this is an excellent store sale! If you want to snag some new vape gear at great prices, then this is a deal definitely worth checking out! You can find this deal at VapeSourcing, where you can save up to 65% off!